During the pre-season most NBA teams are getting a final look of what works best for their roster, tonight the Wizards did just that giving John Wall the night off and well the rest of the starting 4 players the second half of the game off as well in a 126-96 victory over the Guangzhou Long Lions. For the Wizards they got some strong play from some key bench players in Jodie Meeks and Sheldon Mac who led the Wizards with 19 and 17 points respectively. Tomas Satoransky added 13 points along with Jason Smith’s 12 points capped off a strong night for the bench. 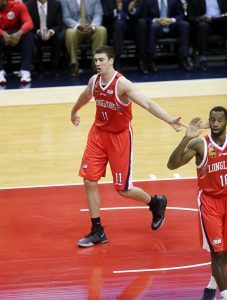 For the Long Lions, former UNC star and seven year NBA standout, Tyler Hansbrough led the scoring with 29 points and 11 rebounds and looked as he was auditioning for a spot on NBA roster, after last playing in the D League last season and signing with the Long Lions this year. “It’s a great opportunity for some of these guys who have never been in a NBA arena before. It’s good for us to come over her and play against one of the best teams in the NBA, we can grow from this,” said Hansbrough. For the Wizards, tonight they also played without John Wall’s primary backup, Tim Fraizer, as he injured his groin last week in Richmond. Next up for the Wizards come a few more realistic challenges getting ready for the season opener against a Carmelo-less Knicks team on Friday and a loaded Cavs team on Sunday.